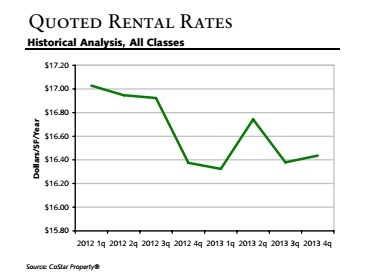 Home» Posts tagged "rental rates"
The fourth quarter 2013 was a big year for the Central Pennsylvania office market. New and existing businesses filled up even more space across the area. As a result, the total vacancy rate saw a substantial decrease from where it was just one year ago and the net absorption totals surged well into the positive numbers, reaching an all-time in high in nearly four years. This activity was a boost to the Central Pennsylvania commercial real estate market. Just one example in the area was listed as the Select Top 10 Office Leases of the year by CoStar. This deal took place in Harrisburg Area East when Comcast took over a 110,000 square foot facility located a 2801 Valley Road. The Central Pennsylvania Office market ended the year with a vacancy rate of 8.2%. The vacancy rate was down over the rate one year ago at this time which was 10.0% in fourth quarter 2012. More specifically, Harrisburg Area East ended the year with a vacancy rate of 9.3% and Harrisburg Area West with 7.0%. This is the first time vacancy rates have dipped below 9.0% in more than four years, most commonly averaging around 9.2% during that time. Complimenting the trend of decreasing vacancy rates, fourth quarter 2013’s net absorption increased to a positive 277,713 square feet. This is a sizeable jump compared to fourth quarter 2012’s which was a negative 189,586 square feet. In first quarter 2013, net absorption rates were at a positive 219,789 square feet before dropping to 200,051 square feet in the second quarter. The third quarter dropped even further, dipping below 200,000, to 191, 956 square feet. The fourth quarter 2013 ended with the largest positive net absorption since fourth quarter 2010. The average quoted asking rental rate for available office space was $16.44 per square foot at the end of the fourth quarter 2013. This represented a 0.4% increase in quoted rental rates from the end of the third quarter 2013 when rents were reported at $16.38 per square foot. So what does this mean for the Central Pennsylvania commercial real estate market and the supply and demand of office space? The commercial office leasing market continues to recover from the deep contraction brought on by the great recession. The key economic indicators that affect office leasing activity (e.g. GDP, employment data, and manufacturing activity) continue to experience improvement. We anticipate that this slow steady trend will continue for the balance of 2014. How have you felt the impact of these changes in the market? Share your ideas and opinions by commenting below!